Are there guidelines that legit approaches to spirituality share, and flawed ones ignore? “Nonsense” in the realm of religion and spirituality never seems hard to find. Ideally, religion and spirituality are forces of truth, love, kindness, wisdom, and everything good and holy in what is often a pain-inducing, baffling, and difficult world. Ideally, as we do our best to solve the existential riddles life throws at us, religion and spirituality are forces that help us become better people, more sane, whole and noble than we would be otherwise. As philosopher Walter Kaufmann said, “There is no subject more important than religion.” If our good friend Walt is anywhere close to the truth there, and this stuff deals with the most important matters in life, then well, it seems like a something we should really, well, kinda get right. Yet (to state the obvious?) there seems to be no shortage of nonsense, silliness, or downright insanity that actually plays out in the name of some form of religion or spirituality. If a lot of nonsense happens in the name of religion and spirituality, what would the opposite of that look like? 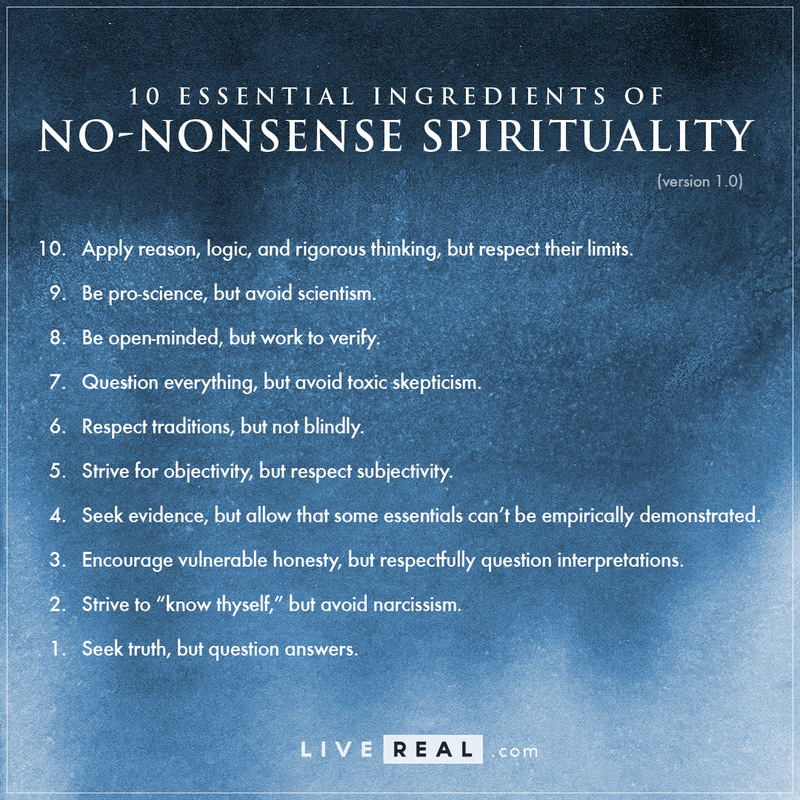 In other words, what would a legitimate, no-nonsense approach to spirituality look like? How do we separate the “nonsense” from the “good sense”? Is there some filter – some sort of existential sieve – that we can use to separate out the wayward, mistaken, wandered-off-the-wagon-trail approaches from the bullseye-right-on-the-money? Some kind of inner North Star that – no matter the approach or denomination – could help us steer closer to truth, reality, love and all the other good stuff, and prevent us from straying too far into fields of crazy? Is there a set of general “fair play” guidelines (or “common denominators,” or “principles”) that non-crazy approaches to spirituality all share? And that destructive approaches ignore? These seemed like questions worth at least a few minutes of exploring. So, we’ve been exploring them. Here – in the open and friendly spirit of a neighbor offering a taste of an experimental new bundt cake recipe – are a few that we’ll humbly set out on the windowsill, with a nice, steaming-hot cup of coffee. 10. Apply reason, logic, and rigorous thinking, but respect their limits. 9. Be pro-science, but avoid scientism. 8. Be open-minded, but work to verify. 7. Question everything, but avoid toxic skepticism. 6. Respect traditions, but not blindly. 5. Strive for objectivity, but respect subjectivity. 4. Seek evidence, but allow that some essentials can’t be empirically demonstrated. 3. Encourage vulnerable honesty, but respectfully question interpretations. 2. Strive to “know thyself,” but avoid narcissism. 1. Seek truth, but question answers. And here’s even a handy little graphic. That said, there’s a difference between embracing these principles (reason, logic, and rigorous thinking) and stretching them way beyond their limits. Which means, assuming they’re entirely comprehensive, fully sufficient, and really all you need. The problem comes when we apply these approaches in areas where they no longer work. They’re vital, no doubt, but that doesn’t necessarily mean that they’ll take us the full distance. Everything good can be taken too far. (And usually is.) Some folks have argued that overusing these approaches actually creates the irrational, absurdist, neo-romantic, postmodern nihilistic and fundamentalist approaches that hard-core rationalists rail against. (Karen Armstrong argues this in The Battle For God, for example.) Which is to say, each of these groups - fundamentalists and hyper-rationalists - might be creating their own enemy. Once you’ve exhausted everything reason, logic, and rigorous thinking and everything they have to offer, there may very well be something essential beyond their reach. Real science, that is. That’s good stuff. The search for truth. “Scientism” can be defined as science overreaching into realms beyond scientific expertise. Which is to say, when it starts pontificating on matters of philosophy and theology. Using physics as a basis for metaphysics, for example, or declaring that only scientific knowledge is valid (which is an epistemological claim, and one that wasn’t arrived at scientifically.) That’s when science runs the risk of mutating into a dogmatic, narrow-minded, faith-based, anti-scientific religion itself. On the one hand, open-mindedness is essential. At one point in our lives, none of us had tried ice cream. It took some openness, some risk, some venturing into the unknown, some experimentation to discover something new, and that was very much way better than diced carrots. At one point in history, much of what we now see as “normal” conventional religion and spirituality was considered fairly new and radical as well. So, open-mindedness is generally a good thing. There’s plenty we don’t yet know about the world. If we only explore what we know, we’ll never discover things we don’t know. But on the other side of the matter: open-mindedness as a central guiding principle, disconnected from anything able to check or govern it, can spin out of control. Unanchored, endless experimentation with no solid ground in sight can become a chaotic, nihilistic blur. A good rule of thumb, as the saying goes: be open-minded, but not so open-minded that your brain falls out. Asking questions seems close to the core of all real science and spirituality. There’s “seek and ye shall find” (seeking, presumably, answers to questions) and “become like little children” (who are, by the way, always, relentlessly asking questions.) Buddha’s final words were “Seek out your own salvation with diligence.” Every zen koan is essentially a question. And so on. Questioning is central. Yet like everything good, questioning can also go too far. When it becomes acidic, corrosive doubt that dissolves everything it touches, it can become stifling instead of liberating. It can also be selectively weaponized into a form of attack, used to cast everything – especially unflattering truths – in a cloud of doubt. And if we play along, it can force us to drown every statement we make in a sea of qualifications. Practically everything we say can be ripped from its context, examined like a specimen under a microscope, and attacked from all sides and torn apart. Which can pressure us to a safe, barren, unfruitful void where it’s easier to eject out of the game completely, and just not say anything. So: question everything. But avoid toxic skepticism. Traditions often started for a good reason. If something’s been around a hundred years, there’s a pretty good chance that it’ll still be around a hundred years from now (at least compared to something freshly born yesterday.) All to say, sometimes, things that have passed the test of time have done so for a reason. Before destroying something, it’s not a bad idea to at least honestly try to understand why it was created to start with, and what problem it was meant to solve. That said, obviously, some traditions are terrible. Plenty of things that once were traditions deserved to go extinct. And others made sense in a particular time, place, and set of conditions. But when those are no longer present, the reason behind it can stop making sense too. So: respect traditions. But not blindly. These two groups often egg each other on. Each looks at the other side, sees its legitimate flaws, uses that as justification for their own position, and digs in. The way we see it, both are essential. We need to respect both objectivity and subjectivity. Eliminate subjectivity, and we all become soulless ghosts haunting a cold, impersonal, in human universe. Eliminate objectivity, and all opinions are treated as facts, which means bias, conjecture, and sloppy thinking run rampant. Objectivity and subjectivity are two sides of the same coin. And we need both. So, strive for objectivity, yet respect first-person subjective experience. Evidence, verification, confirmation, validation, falsification and so on are crucial ingredients to solving problems and making progress in these realms. Mere opinions, or “just declaring things” that can’t be verified or confirmed in any way should be seen as a starting point for inquiry. Not an end point that we’re arrived at. That said, some things are true that can’t be proven. (That you love a certain person, for example.) Maybe even the most essential things are beyond the reach of empirical demonstration. Honesty in these realms is mandatory, if we’re at all serious. (Without that, it’s like lying to a therapist or in a confessional booth. It defeats the entire point.) And real honesty usually means vulnerability. And vulnerability – a raw human soul being exposed – should be respected, heard, and treated with care. That said, being both honest and vulnerable doesn’t always mean you’re right. We all have our experience, but we also interpret our own experience. And sometimes, our interpretation of our experience can be a bit off. (Or more than a bit.) And for this reason, respectfully questioning interpretations – our own and others’ – (see #6 above) can be a good thing. 2. Strive to “know thyself”, but avoid narcissism. “Know Thyself” was carved into the marble of a Greek Temple thousands of years ago. Apparently, they thought of it as advice that was at least somewhat important. And they seemed to be on to something. After all, we study the universe with our minds, but we often forget to study the minds we’re using to study the universe. Many smart folks throughout history (from the authors of the Upanishads to Socrates to Aquinas to Jung, just to name a very few) have spoken about the central and urgent importance of self-knowledge. The idea seems to point toward something hidden in the depths of our natures that often goes undiscovered in the ordinary course of life. Call it the “Atman,” the “Buddha nature,” the “conscience,” the “law written in our hearts,” “the spirit of God in man” and so on – whatever you might call it, there seems to be something there. But there’s a crucial distinction here. “Knowing thyself” is different from narcissism. “There is something sacred within me” is very different from “I am God/Goddess.” Worshiping “God” is profoundly different from worshiping oneself. Enlightenment isn’t mere ego inflation. 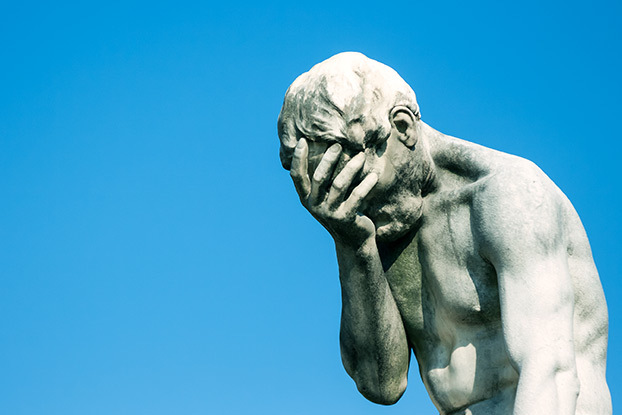 Confusing God with one’s ego and one’s ego with God is a recipe for confusion, and worse. Sorting this out can be a serious problem. Maybe even THE problem. This distinction is crucial. It might literally make all the difference. And what happens then? What happens when we find answers? Let’s not assume, in other words, that any answers we land on are THE answers, the final chapter, the last words that need to be said on the matter, period, end of sentence, close the book, full stop. A very real hazard in all this is folks declaring themselves fully enlightened prematurely. They might think they’re having an enlightenment experience when they’re actually just experiencing a God Complex. Good answers are, well, good. But when it comes to assuming that they’re the Full Picture, there’s good reason for caution. Our plan is to continue working on these. To refine them, de-bug them, make them sharper, lighter, more accurate, more lethal to all nonsensical idea-clouds that rain their dreary, joyless loads of confusion down on folks everywhere, and more invigorating to forces of real truth, love, kindness, wisdom, and all that other stuff we mentioned earlier. So, let us know if you spot any bugs, want to suggest any improvements, or want to embarrass us with effusive, gushing praise, throw underwear at us, or tell us to keep up the grueling, thankless, costly work. Or, if we’ve made any stupid mistakes, and you want to say “Hey, puddlehead: what about X?” Yes, we want to hear about those, too. Seriously. So, if you think our experimental bundt cake is missing a key ingredient or would be much better if we’d only add marshmallows and gummy bears, for example, well, we’re interested in hearing about it. Honestly. Because that might help us improve it. Our hope is that by the time we’re at version 97.42, these will be sharp enough to pop any balloons that float within a few feet of the pixels they’re made of. And hopefully by then, a lot of the sloppy thinking and unhinged silliness that’s being thrown around out there today will be a lot rarer than it is today. And in the meantime, hopefully some of this can help us sort some sense from nonsense.